The first batch of DLC characters for NetherRealm’s Injustice: Gods Among wrapped up a few weeks ago with the addition of General Zod. 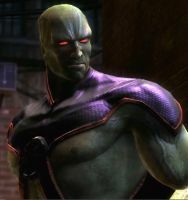 Now the company has announced the start of a new set of characters, the first of which is none other than fan favorite Martian Manhunter. Furthermore, a new skin for Green Lantern is set to be released that will see him as John Stewart instead of Hal Jordan. No release date or pricing has been announced, but check back here for all the details when we learn them. In the meantime, check out the video of these two fighting below. “Gods Among Us” is a bold new fighting game franchise that introduces a deep, original story featuring a large cast of favorite DC Comics icons such as Batman, Cyborg, Harley Quinn, Nightwing, Deathstroke, Solomon Grundy, Superman, Lex Luthor, The Flash, Green Arrow, Wonder Woman, Green Lantern, Aquaman, Bane, Catwoman, Shazam, Black Adam, Raven, the Joker, Doomsday, Killer Frost, Ares, Lobo, Batgirl, General Zod and Mortal Kombat’s Scorpion. Set in a world where the lines between good and evil are blurred, players will experience heroes and villains engaging in epic battles on a massive scale. Injustice: Gods Among Us is available now for the PlayStation 3, Xbox 360 and Wii U. You can read our review by clicking here.